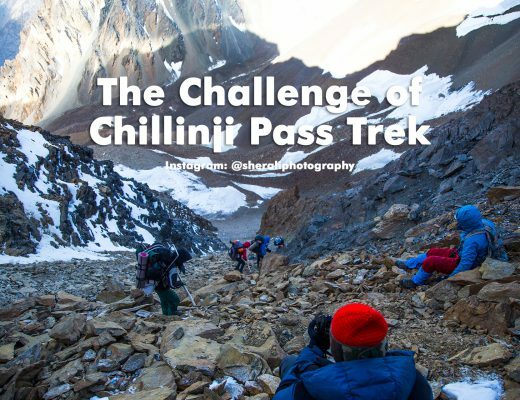 Chillinji pass (5,335 m) was the trek I had chosen for year 2017 as my annual trekking trip. 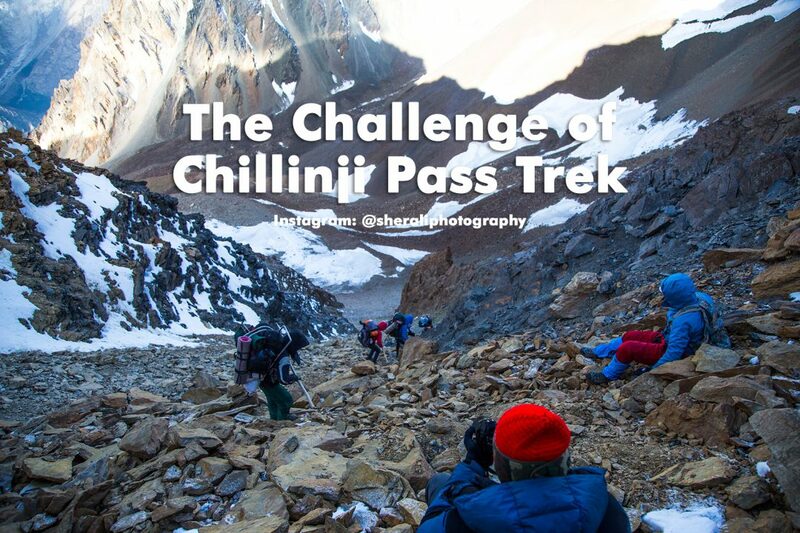 Chillinji pass was not only a challenge as a trek but also a challenge to manage permission, from both civilian and as well as army, for going beyond Ziarat in Chapursan in Hunza valley and crossing Chillinj pass towards Ishkoman valley. We were 4 friends i.e. myself Sher Ali Saafi, Abdullah Saleem and Mustafai Subhani. My duty as always was to create a public Facebook event in order to gather 4-5 people for the trek, Abdullah’s duty like always started as soon the trip started to manage the logistics during the trip. Amjed bhae prior to trip made sure that we all are in and don’t backout at last minute. Getting permission from Army was Subhani bhae’s duty. 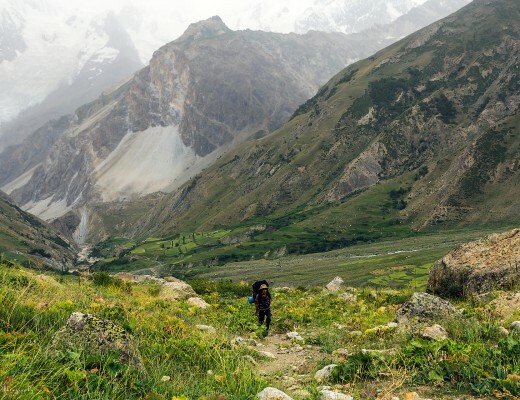 Few days prior to trip I saw some posts on Facebook group “The Karakoram Club” where people were talking about sudden ban on tourists in Broghil valley. I got panicked and contacted Subhani bhae that we have this situation. He assured me that our permission is confirmed and I shouldn’t discuss it further. So 2 days before our departure Subhani bhae went to Hunza and got NOC from civilian govt. He had already arranged permission from FCNA Gilgit. On 15th of August I went to Margalla hills for a quick hike to stretch my legs and same day at night the 3 remaining members (me, Abdullah and Amjed bhae) left for Gilgit in a booked car. On 16th of August we reached Hunza. 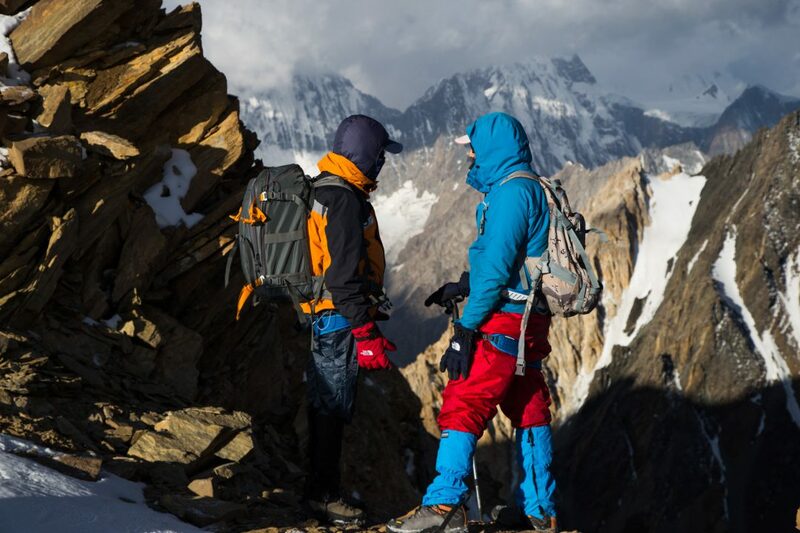 I was in contact with Hafeez Gojali, our guide to be, from Chapursan valley so I called him to meet us in Karimabad to strike deal and get set for adventure. Hafeez Gojali had done Chillinji pass just a year ago with Umair Hasan of Ascender and it was Umair who had recommended Hafeez to me. He is a simple person and doesn’t talk too much so he wasn’t open that much to negotiations hence we had no choice but agree to his terms on porter/guide fees. Same night we managed to book a jeep to ride us to Baba Ghundi Ziarat. Early in the morning of 17th August we started our journey towards Baba Ghundi Ziarat in a 4×4 jeep. We did few stops on our way. Our first stop came at Gulmit where I wanted to meet Saeed Rahman, with whom I had been in touch for a quite sometime, for tea. So we met him at Gulmit Continental hotel and had a casual talk on tourism, trekking and adventure in northern areas of Pakistan. 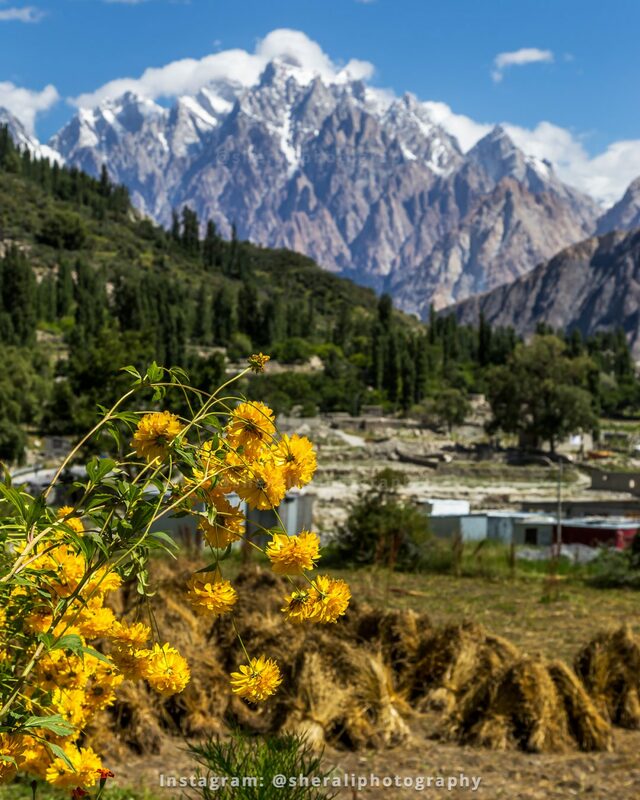 After the tea I took a shot of Passu cones and started our journey ahead. Next we stopped at Khyber village to buy some apricots for us. I myself like the half dried apricots hence I couldn’t stop eating plenty of them at Kheyber before depriving ourselves from fruits for next 3 weeks. After Khyber we stopped at Sost for some grocery shopping. We spent more time at Sost than expected. Once we were done with shopping we went through entry process at the gateway of Chapursan and then we resumed our jeep adventure in the remotest region of northern areas of Pakistan. After couple of hours we reached Hafeez Gojali’s house at Zood Khun where he treated us with local dishes on lunch. His father was a great player of Rubab and treated us with pleasing tones of Rubab. We also mmet famous mountain guide Alam Jan Dario of Chapursan valley. After lunch we resumed our journey towards that day’s final destination i.e. Baba Ghundi Ziarat. By afternoon we reached Baba Ghundi Ziarat where army personnel confirmed our arrival to FCNA and also confirmed our permission for Chillinji pass. We spent the night in two hut rooms of Alam Jan Dario at Baba Ghundi Ziarat. Some members of support team (porter party) had already joined us including Alam Jan Dario’s son Azam Dario. Baba Ghundi Ziarat in Chapursan is named after sufi saint Baba Ghundi. Lots of locals from Gilgit and adjacent areas visit Ziarat during weekends. Next morning, our first day of trek, 3 more porters were supposed to join us from Zood Khun but they didn’t come so eventually Hafeez himself went back to Zood Khun to arrange the rest of the 3 porters. 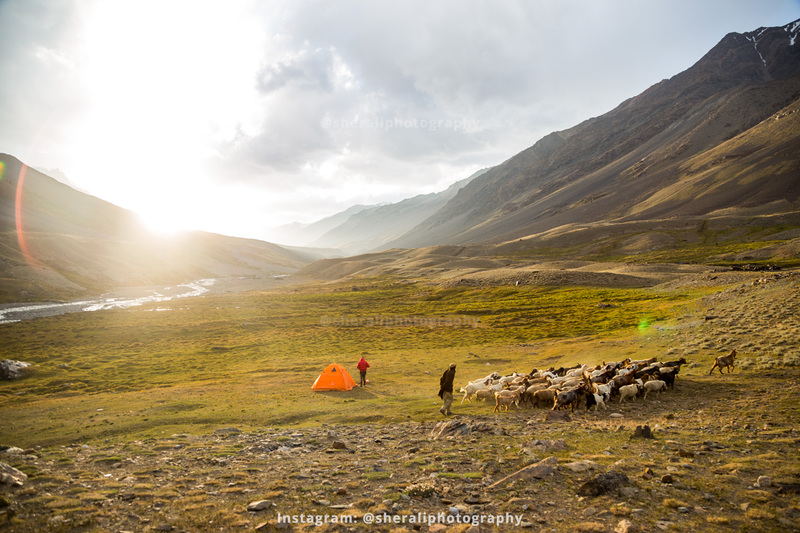 We along with other porters, among them was famous Wakhi singer Fazal ur Rehman, started our trek slowly towards Biyatar which was going to be our first campsite. 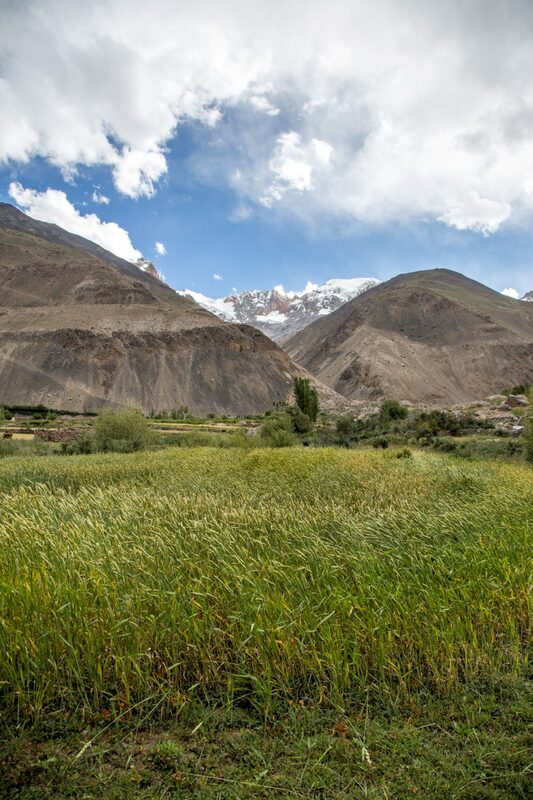 The first day’s trek was very dry and also very close to the Wakhan corridor of Afghanistan. There was an area which reminded me of redish mountains of Arizona, USA (I haven’t been there but have seen lots of photos on Instagram). We stopped there for a short tea break in a shepherd’s hut. We resumed our trek after tea break. Me and Abdullah were ahead of the party and there came a point where we had to cross a stream. There was a bridge but we didn’t know how to get there as the trek disappeared all of a sudden. Luckily 2 shepherds were bringing back their herds across the bridge so they spotted us and guided us using gestures. We found the trek and went to the bridge. As soon as we started crossing the bridge the herd also reached there and there were chaos at the bridge. If one of the shepherds hadn’t hold my hand I might have fallen deep down in the flooding stream because of the herd. We waited there for the rest of the team members and they we resumed our journey. The light was fading but we were also getting closer to our destination. An hour before sunset we reached our campsite. We pitched the camps, cooked the dinner and went to sleep. On 19th of August 2017 and on our 2nd day of our Chillinji pass trek nature welcomed us with a beautiful bright sunny day. After breakfast we started our trek and immediately it getting started tough because of uphill hike. Soon we were gaining too much altitude and there came a narrow point where we could barely keep one step at a time. 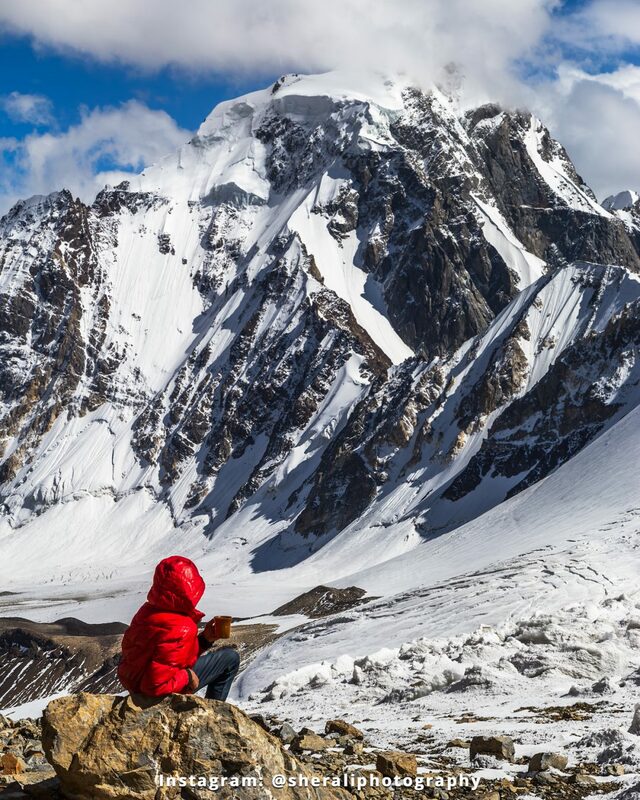 We took a break after that section and resumed the trek towards Chillinji base camp. It was again a very dry day, though we were already walking near a grey glacier. For tea break we found a flat area but there was no shelter for shade and water was brought from a glacial steam which almost a 500m away. After tea break we resumed the trek through boulders and by evening we reached Chillinji pass base camp. There was a campsite but very little water was available. It was a tiring day so we made quick dinner and went asleep. August 20, 2017 was also a bright sunny day and this day our target was to camp just before the Chillinji pass at high campsite. The trek was too steep right from the start and on the top it was all through scree which made our job very difficult. With Allah Almighty’s Fazal we safely reached our campsite just before it started snowing. Myself and couple of the support team guys climbed a little further up to have a look at the Chillinji pass. There was no proper campsite hence we had to manage a night there and then move on. After dinner porters played cards while 4 of us went to sleep early. On 4th day of trek of we had to cross Chillinji pass so we had to wake up early in the morning in order to cross the pass while the snow was hard. By doing this we wanted to avoid soft snow which makes it difficult to cross crevasses. We woke up at around 4:30am. Did quick breakfast and start the trek at 5:15am. Alhamdolillah, it was a clear day so we didn’t have to face visibility issues or snowstorms. At the middle of the pass at only one point we faced difficulty where we found a crevasse blocking our way so had to take a detour. By 6:45am we were at the pass. We took sometime to take celebratory photos before tackling the real challenge which was to descend towards Ishkoman valley. Amjed bhae celeberated by open of a coke bottle (you know that kind of celebration you see in the movies) which had saved for this day. After the photo session had a look at the other side and decided to descend without fixing the rope. 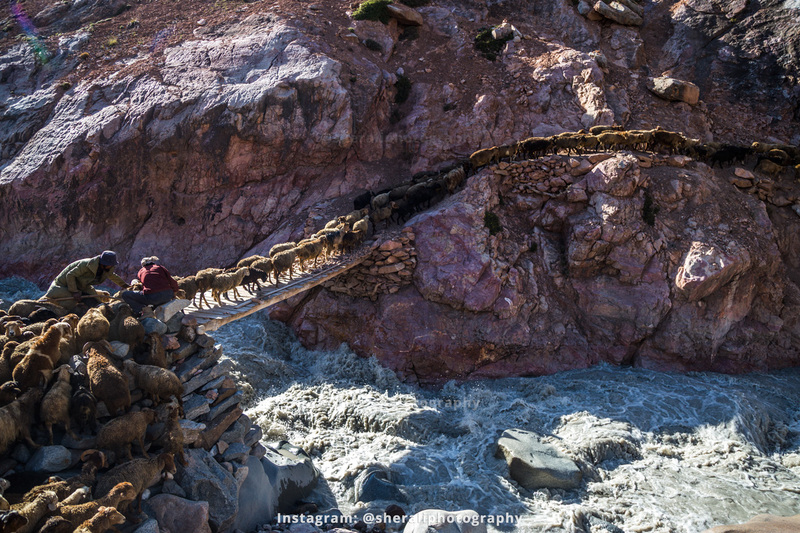 Porters, being the people of mountains, went down real quick but had to be more careful. Subhani bhae was ahead among us, next Amjed bhae started descending, then Abdullah with the help of our guide Hafeez and I was the last person to start descending. Soon I had to take our from Hafeez and Abdullah. We had to maintain some gap because the scree was too lose and there were some big sharp rocks which were also going down with us as we were going down. Luckily we all came down safely towards Ishkoman valley side of base camp of Chillinji pass after couple of hours. We took a tea break and had a long look back at the pass from where we had just come down. With a sigh of relief we started our journey towards our next campsite but little we knew what was waiting for us in our way. After a brief wasy walk downwards we once again faced downwards steep scree. There was no path so just had get down by making our own path. This time Hafeez was ahead of us all so Abdullah refused to come down without help and opted to wait for porters to help him come down. After another hour of struggle we finally reached plain area of the trek. 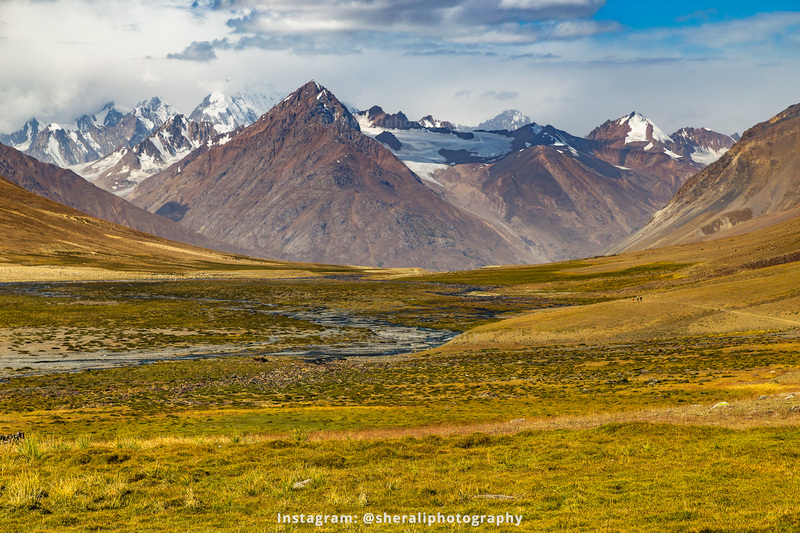 It was Virgoth where there is a forest of Betula papyrifera (paper birch) next to Virgoth glacier coming out of Kuz Sar mountains range. We camped at the start of the forest and witnessed a beautiful sunset on that evening. There were also couple of beautiful wild horses. 5th day of the trek was yet another beautiful bright sunny day. After the breakfast we started our trek through the forest along a stream. This was a beautiful part of our trek so far because it wasn’t so dry and there was plenty of shade of trees and then there was clean water stream. After couple of hours of walk we reached an open space along side Karomber river, called Chillinj medan, where there was a small shepherd hut made of wood. We wanted to go to the hut but there was also a dog which was trying to scare us. Then 2 people came out of the hut and came to us. They greet us and asked us if they can help us in anyway. I bluntly asked if they can serve us some Lassi if they have to which they said yes. Lassi at such a remote place was not less than a treat. After drinking pure Lassi of mountain goats we started our journey along Karomber river which was coming right from Karomber lake. We had to cross the river to the other side so we were looking for a suitable patch of the river. Finally we find an area were the river was too wide and divided by a dry patch hence the flow of water was low and could cross it without much trouble. First Hafeez along with a porter cross the river while being tied to a rope which was being held by rest of the porters. Though the water was too cold and there were boulders below our feet but with the help of rope we all crossed the river safely. Rest of the day was easy walk along Karomber river. We did tea break at Sokhtarabad which is one of the few remote villages in the Ishkoman valley along Karomber river valley. Hafeez went to locals houses to bring us some Lassi which he did. 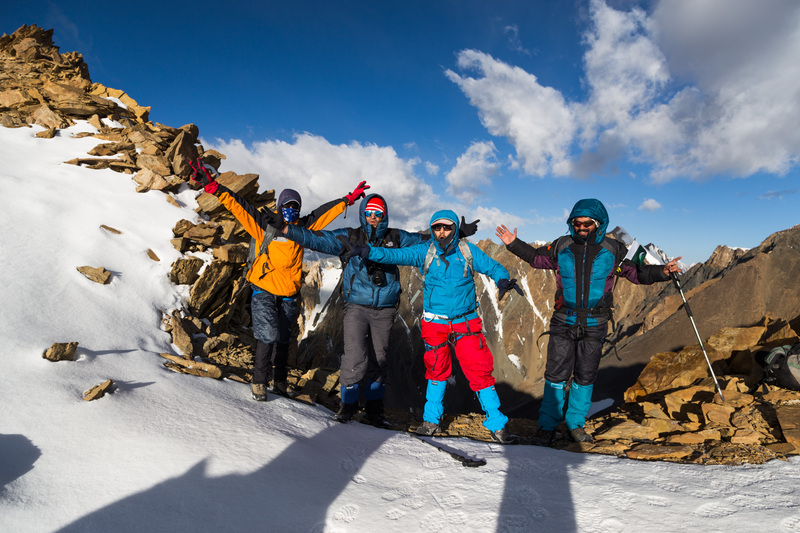 After little rest we continued our journey and eventually reached Chitti Boi glacier. 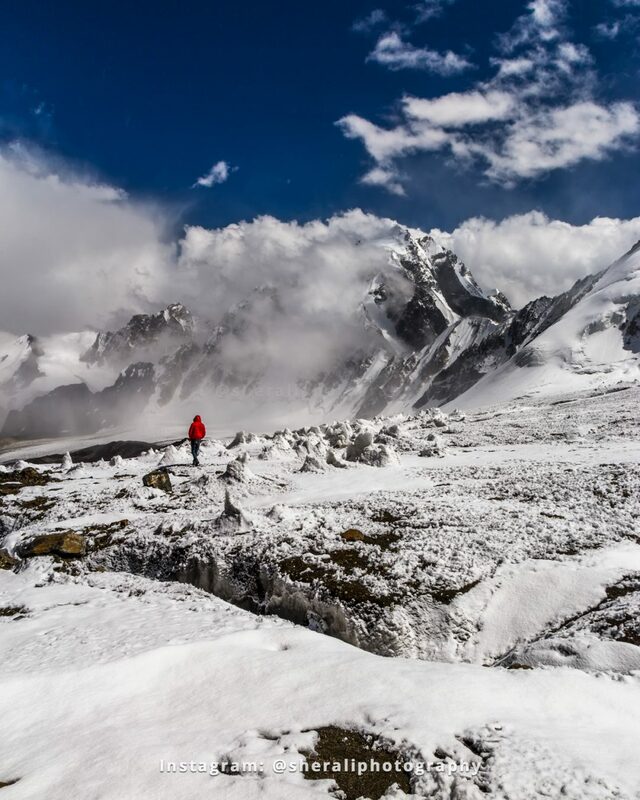 Chitti Boi is one of the glaciers which originates from Chianter peak (the same peak from which 34km long Chianter glacier originates and is the source of Chitral river). Unfortunately we followed Yaks trail and hit a dead end. We wasted couple hours there. Soon it started to get dark so we decided to go back and find a suitable camping spot. 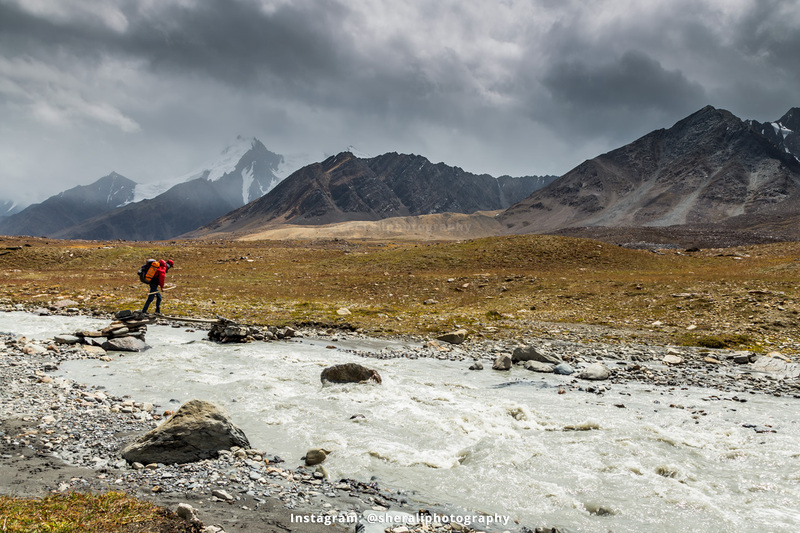 Though our guide had done Chillinji pass trek before but he had exited towards Ishkoman side so this was his first time towards Broghil valley. But as soon as we turned back one of the guy spotted an easy way to enter the Chitti Boi glacier. We followed that entry point and went down to glacier side. 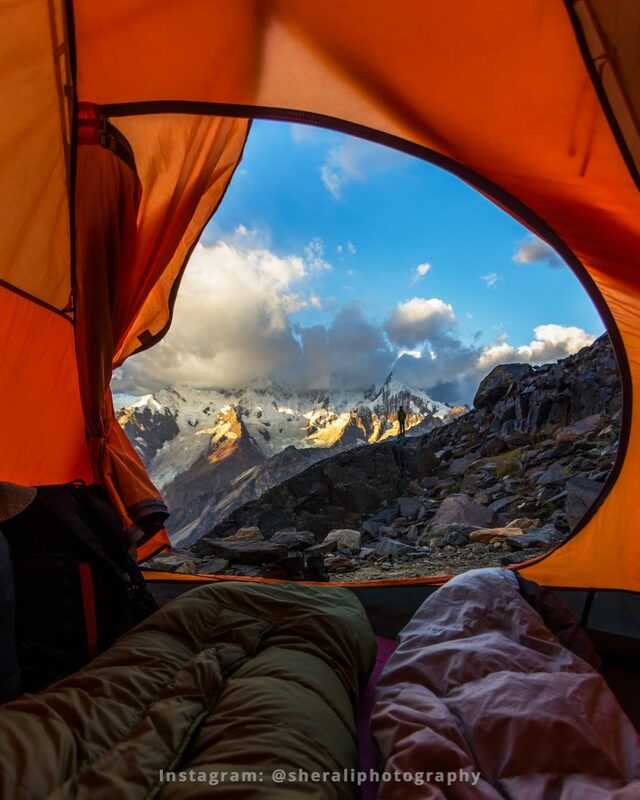 We decided to camp just out of the glacier to avoid extreme cold. Water was an issue but we had no options so had to do with whatever water available there from small glacial ponds. 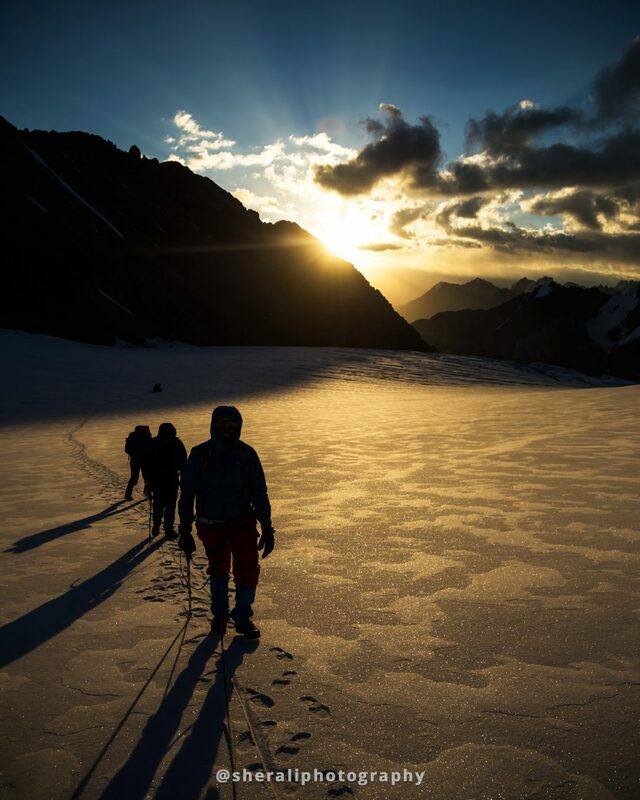 After dinner we went to sleep with the decision to wake up early and cross Chitti Boi glacier as soon as possible. After spending last night in dire circumstances we spoke early on the 6th day of our trek and after quick breakfast we started our journey towards our next destination i.e. Shwinj. But first we had to cross notorious Chitti Boi glacier. 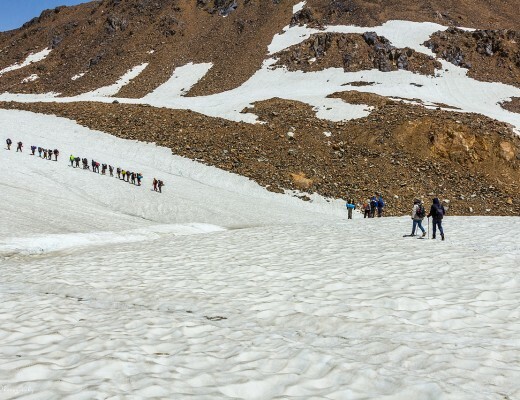 I had heard a lot about this glacier that how tough time it gives to the trekker. 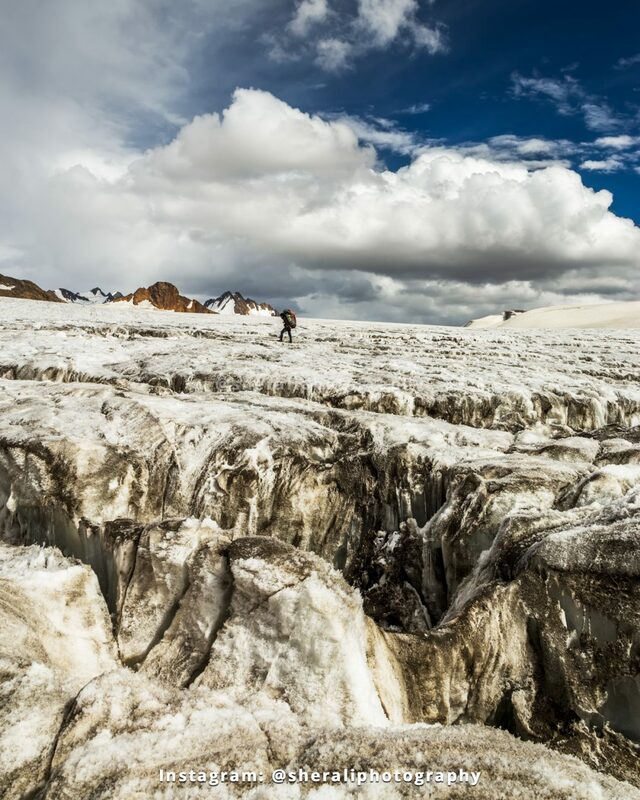 It gave us hard time as well and wasted couple of hours going back and forth to find a way out of the glacier. Once we were out of the glacier then it was almost straight path with very minor altitude gain. After couple of hours of walk we came across a flooding glacial stream which we must cross. We tried to find an easier spot but not chance. Eventually we settle for a narrow section and then used the same procedure which we used at the first river crossing on 5th day of the trek. After crossing that glacial stream we opted for our tea break as usual. Feeding ourselves enabled us to move towards last stretch of the day. At around 6pm we reach our destination of the day. There was an empty hut with kitchen so opted to spend night in that room. Shwinj is a small shepherds’ summer settlment which 3-4 families live for 4-5 months during summer. One of the guy was the brother of the person who served us Lassi at Chillinj medan 2 days ago. So we had a nice talk with him and he served us some Lassi and yogurt. We spent a warm night at Shwinj. 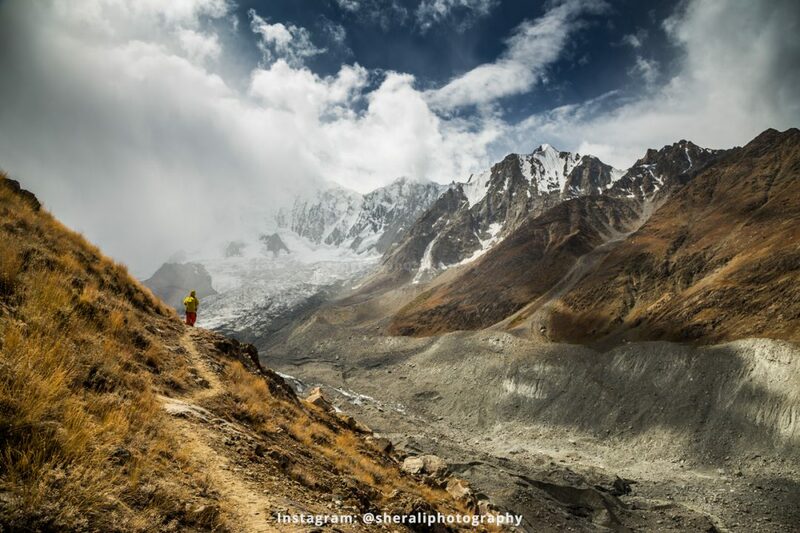 I cannot tell how good you feel when you reach a destination after trekking for 7 long days. Like they say in Urdu “Dil bagh bagh ho jata hai” so it just that moment. 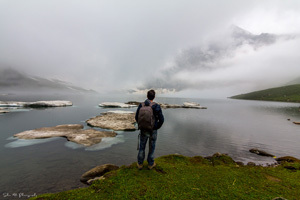 This time we reached the lake from opposite site which I personally wasn’t able to explore so this time I was firm on my plan that we we will spend 2 nights, 1 night on each end, at Karomber lake. We had plenty of time at our hands. We went to camps while our support team prepared tea and special Pakoray for us. The sport team opted to play cards for the rest of the time. Abdullah had no interest in photography so also spent time with the sport time. 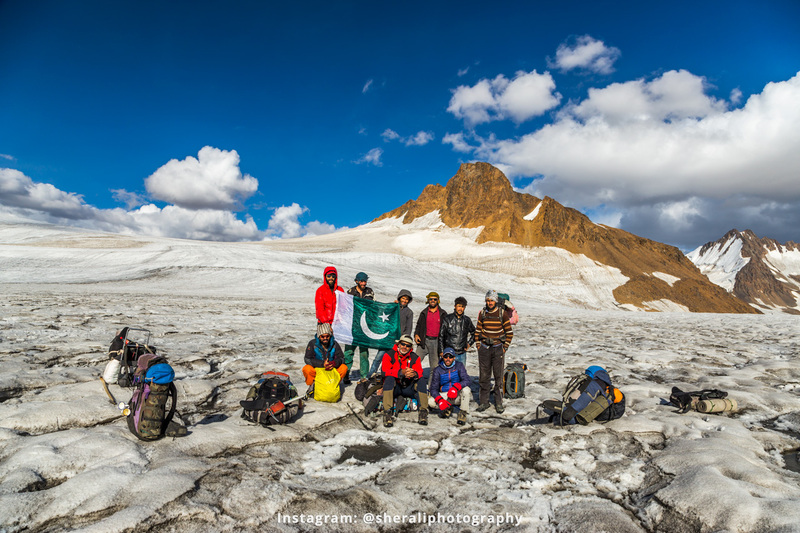 Amjed bhae and Subhani bhae most stayed together not just at Karomber lake but throughout whole trek. I myself opted to go to and find ponds around lake to take reflective shots. I setup one camera for timelapse and took random shots of reflections wherever it was possible. It was just us, Allah and beautiful nature. We did dinner and went to camps soon as usual. 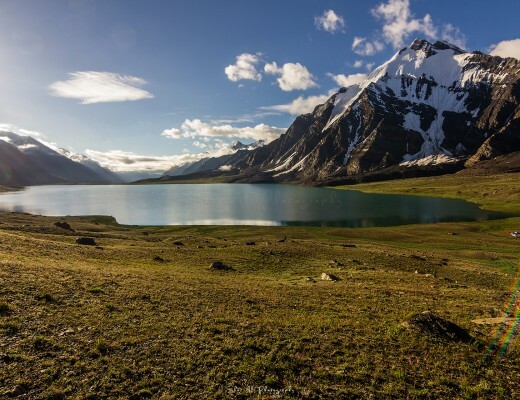 Since Karomber lake situated at Karomber pass, connecting Broghil valley of Chitral with Ishkoman valley of Gilgit Baltistan, so one mostly finds strong winds blowing all the time. So there was no human or human made noise like in the cities but the wind kept us entertained with shun, shun. But we had a good sleep as we were dead tired. Today was our rest day Karomber lake but we had to move our camps to the opposite for night camping. After breakfast and photo sessions we slowly started to walk to the opposite side of the lake. At one spot we stopped and I myself took a dip in lake (this is the only lake where I have taken dips, on both of my visits). The water was too cold and weather became cloudy which made the rest of the day a bit difficult for me. When we reached the opposite side of Karomber lake we noticed a camp there. There were 2 people from Lahore along with 2 Chitral scouts personnel. One of the guy belonged army hence Chitral scouts were accompanying. Amjed bhae had a good time talking to them as they had some common friends. In the morning the Chitral scouts guys came to our guide and told him about some donkey. The other party left straight for Ishkarwaz early in the morning. We had to go to Lashkargaz so we were not in that much hurry. We did our breakfast and start the trek at around 8:15am. 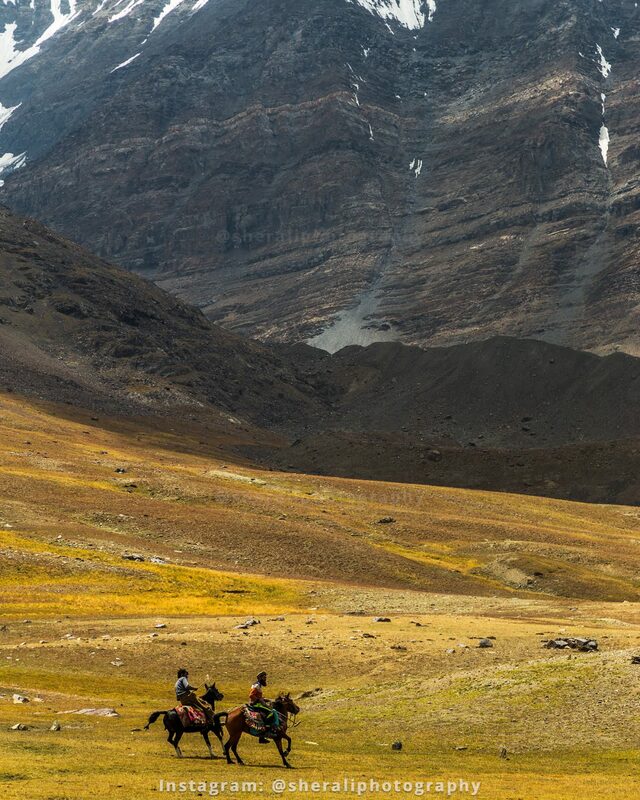 Soon me and guide were at a spot from where you see a huge flat meadows area, just like you see in Deosai, and found that special donkey there. This time I asked Hafeez the story of the donkey and he said that it belonged to the Chitral Scouts but ran away early in the moring. The scouts had told Hafeez to bring it down if he finds it. So he found it and now was waiting for the porters to bring and shift their loads to the donkey. 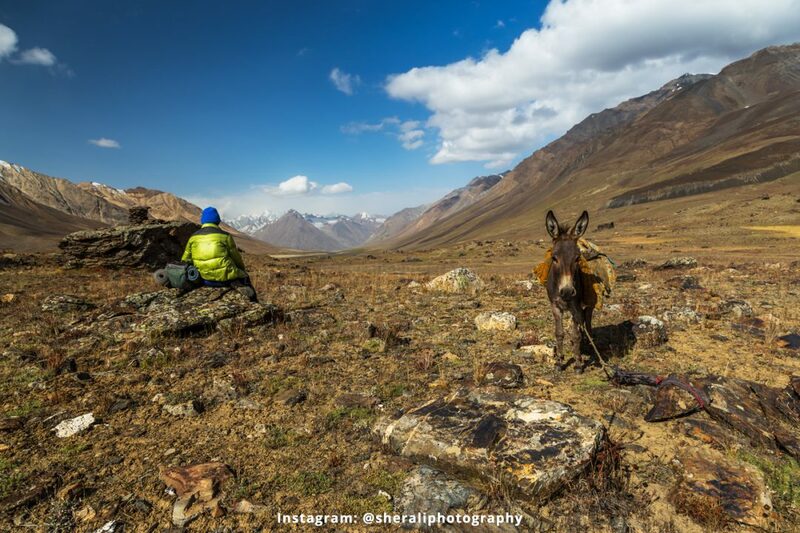 4 porters shifted their loads to the donkey and used it for days till Ishkarwaz. It was a big help for me in the middle of nowhere. Near Showarsheer village the trail splits into two, one goes through the village while the other goes above the village. We chose the one which goes above the village and when we took a break at a spot where there was a stream. Abdullah came to me and said that you missed meeting your Instagram friend Usman Zubair. 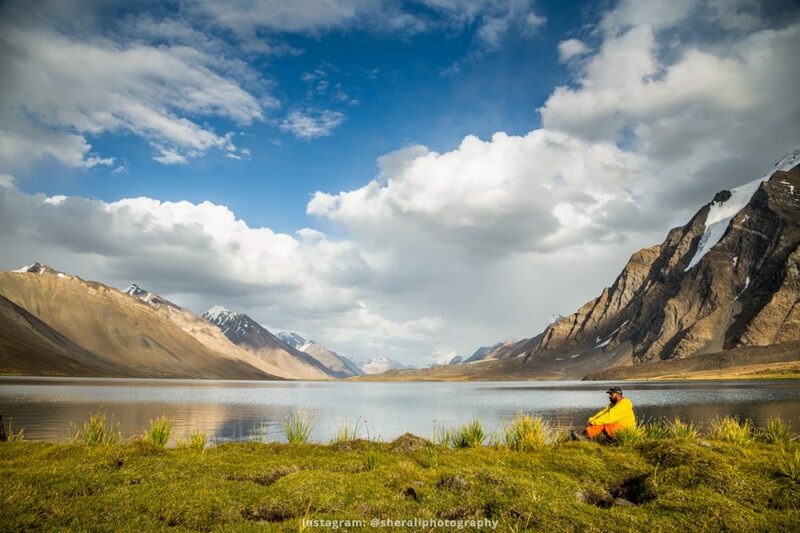 Usman Zubair is a travel phtographer from Multan and he mostly rides bike to explore the north. 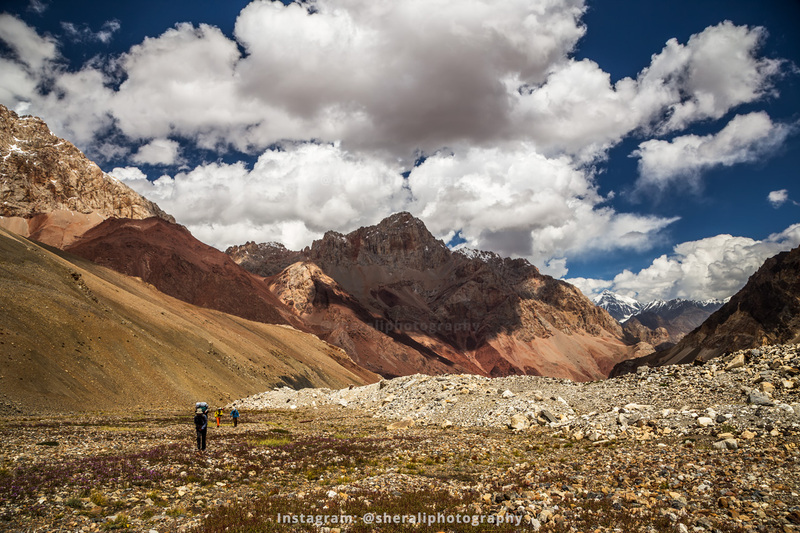 Hence he had reached Lashgargaz on bike, parked it there, took a guide and started trek towards Karomber lake. He has shared his journey in a story highlights on his Instagram account. In 2015 the jeep road used to be till Ishkarwaz but in 2016 road extension project to Lashkargaz was initiated and work was still in progress in 2017. Though it was all descend till Sultan’s guest house in Lashkargaz but it is quite a distance hence we reached our destination by 4pm. Sultan and his father welcomed us. They treated us with whatever they had. They were also in sorrow that Sultan’s brother had recently died in a road accident. 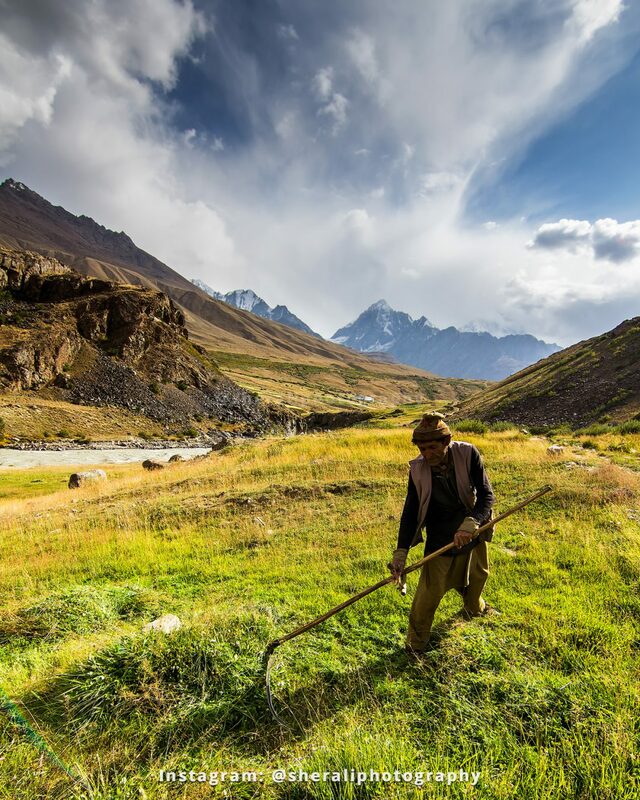 Sultan’s other brother Amin is a UC chairman of the area and has played major role in the past to organize annual Broghil festival at Lashkargaz. As usual after dinner we went asleep. 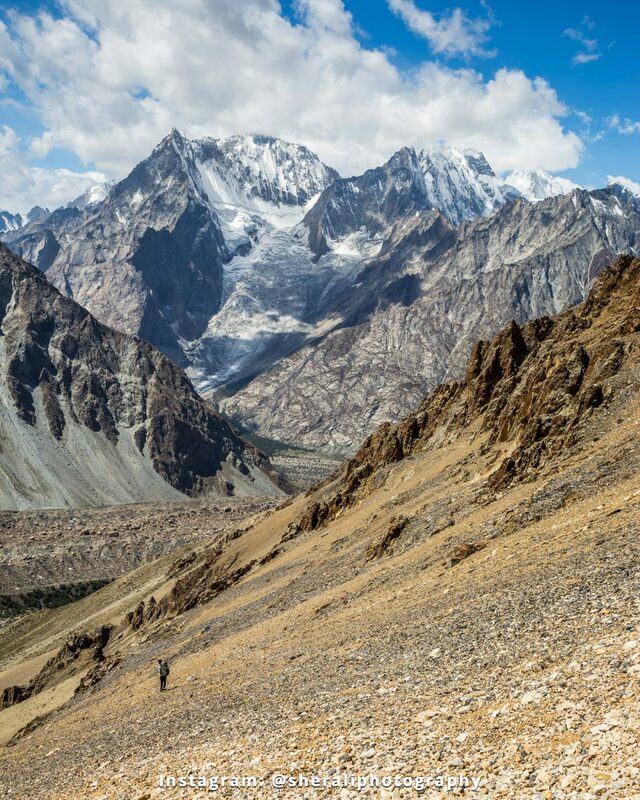 From Lashkargaz a trail goes to Wakhan corridor of Afghanistan. 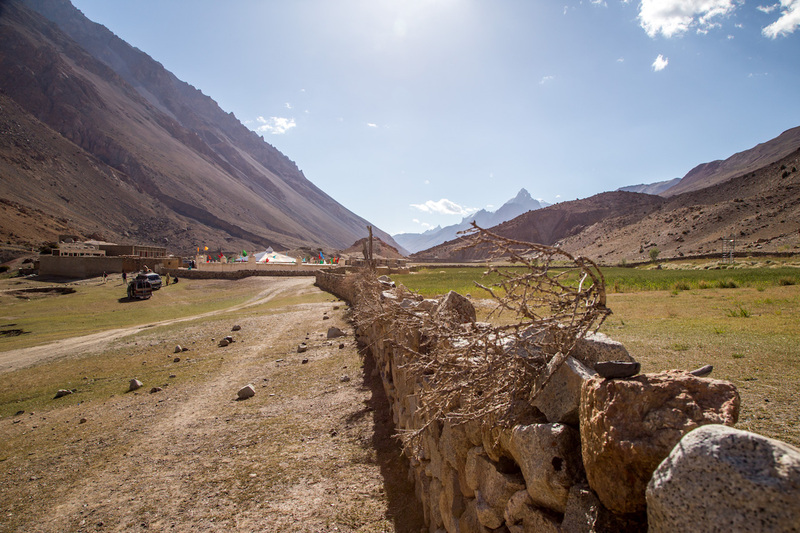 The pass at the border is known as Darwaza pass. 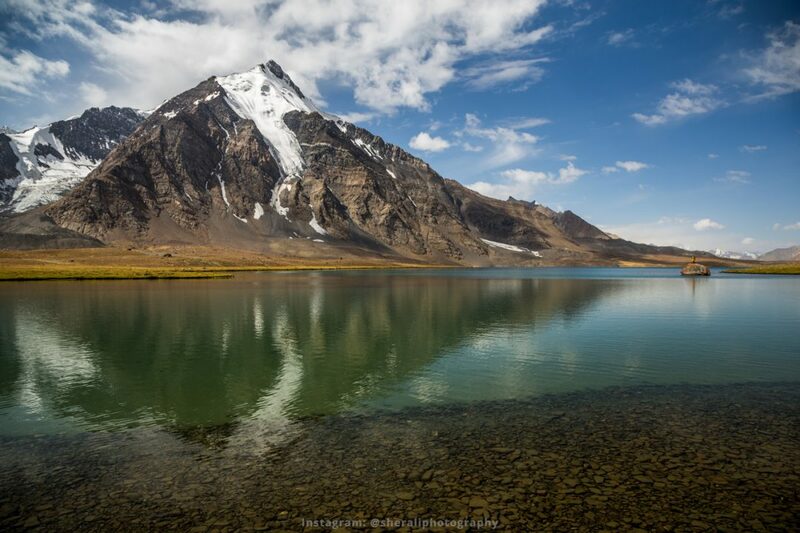 There are around 6-7 lakes around Darwaza pass in Pakistan’s territory. 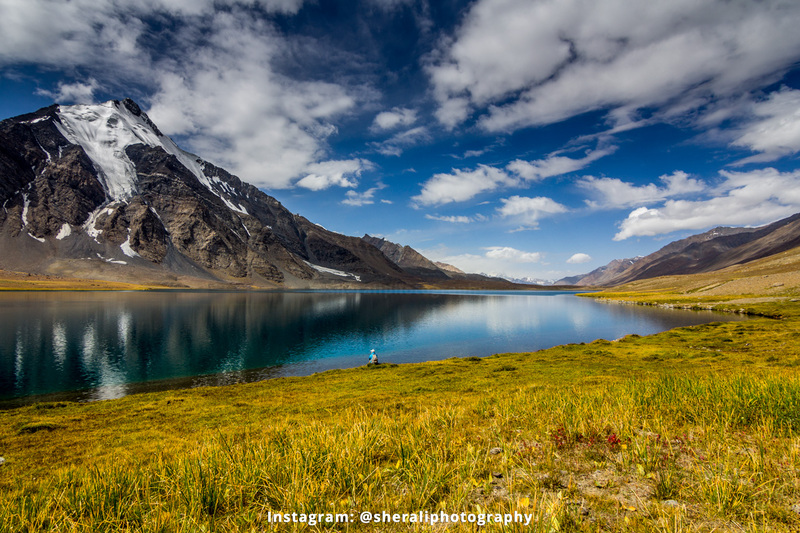 In 2015 I had missed exploring Darwaza pass lakes so didn’t want to miss them again. 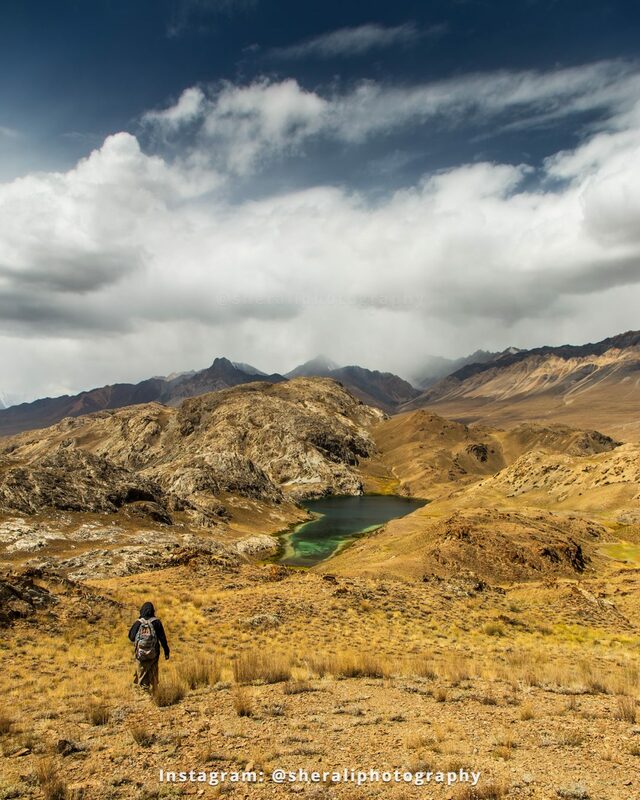 I requested Sultan to be our guide for the day and help us explore those hidden gems of Broghil valley. So after breakfast we started our trek and soon we took diversion towards Darwaza pass trail. 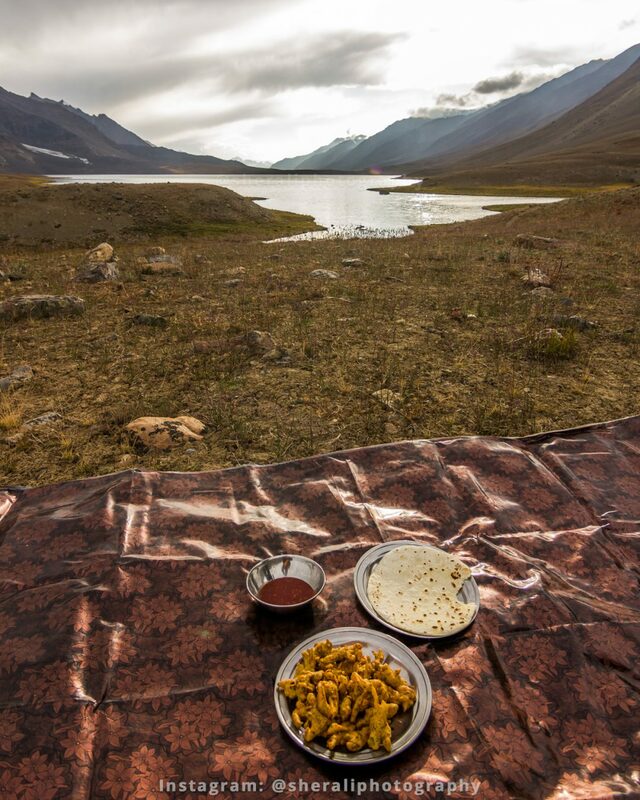 It took us around 1 and half hours to reach first lake of the Darwaza pass. We spent a little time there and then moved towards Darwaza pass. We reached the pass and had a good look at the other side of the border. We could see Sarhad-e-Broghil village in far distant across the border. 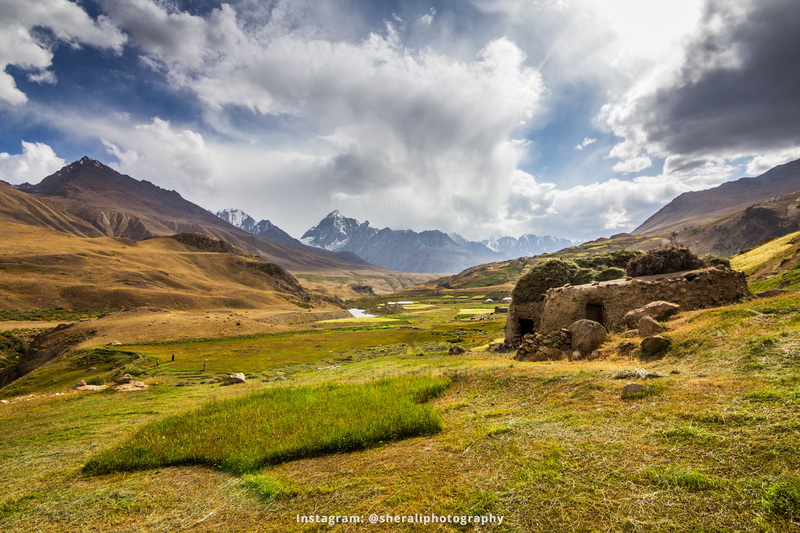 Wakhan corridor is a peaceful area and has even survived the worst war days of Afghanistan. It is because it is a narrow strip with very harsh weather so only few thousands nomades live in scattered settlements. After photo session we returned and went towards other lakes of the area. One by one we went exploring lakes and by afternoon we were getting close to Garail, another village of Broghil valley. Sultan took us inside a solely home and brought us some Yak’s Lassi and yogurt with dried bread. Overall we explored 4 lakes, skipped 1 by choice and skipped 2 more because of lack of time. Now it was time to stop exploring lakes and instead reach our today’s destination of Chikaar. We didn’t disturb him, knowning that we will eventually meet at Ishkarwaz, and followed our trail. Right before Chilmarabad, another small village in Broghil valley, Usman came behind and we finally met. After a brief chit chat Abdullah rode with Usman towards Ishkarwaz and rest of us trekked. When we reached Ishkarwaz Chitral Scouts chowki then a bit of drama was created at our arrival. The scouts and their captain was surprised to see unexpected visitors since there was a afresh ban on tourists in the region. But we told them that we have permission letter and permission from FCNA which they can confirm if they wish to. Upon seeing NOC letter from Hunza AC the captain ordered tea for us. So Abdullah and Usman left for Mastuj and we left for Chikaar. After an hour we reached Chikaar where Sultan took us to one of the Chitral Scout guys home whom we had met at Karomber lake. Actually the donkey belonged to this person. He offered us to stay in his home instead of pitching camps. We accepted his offer and spent a cozy night in his home. It was 11th day of our trek and today we had to depart towards our 3rd (1st was Chillinji pass and 2nd Karomber lake) milestone of the trip i.e. Darkot pass. After breakfast we said goodby to everyone including Sultan and hoped to see him in Islamabad during winters. Once again we were on a very dry trek. After couple of hours of trekking we were at the base camp of Darkot pass where we did a quick tea break. Since our original plan was to spend a night here but now we had plenty of time so we decided to move ahead. We started towards the pass and reached the top by 4:30pm. Took quick celebratory photos and started descend towards our next campsite of Khambakh. 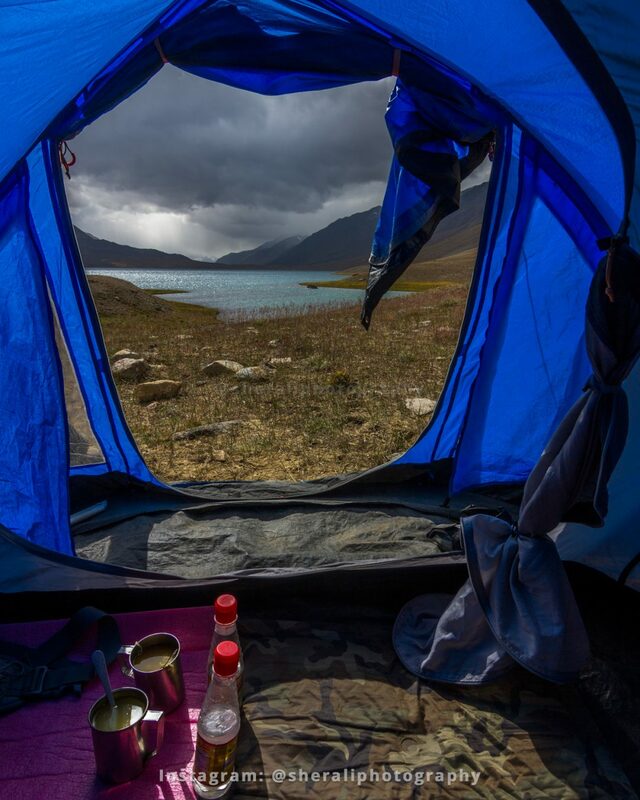 My experience from 2015 trip at Khambakh was not very pleasant because the place was not suitable for camping, camps were pitched loose and by morning all camps were down due to strong winds at night. 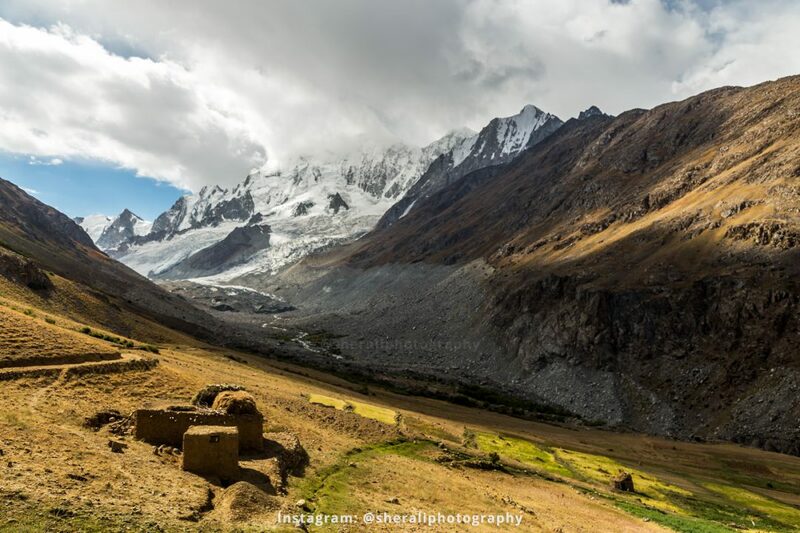 That time we had come up from Darkot side in 1 day on our first day of trek which was a daunting task and many of us feel the side effects, including myself, of sudden altitude gain e.g. headache, vomiting etc. 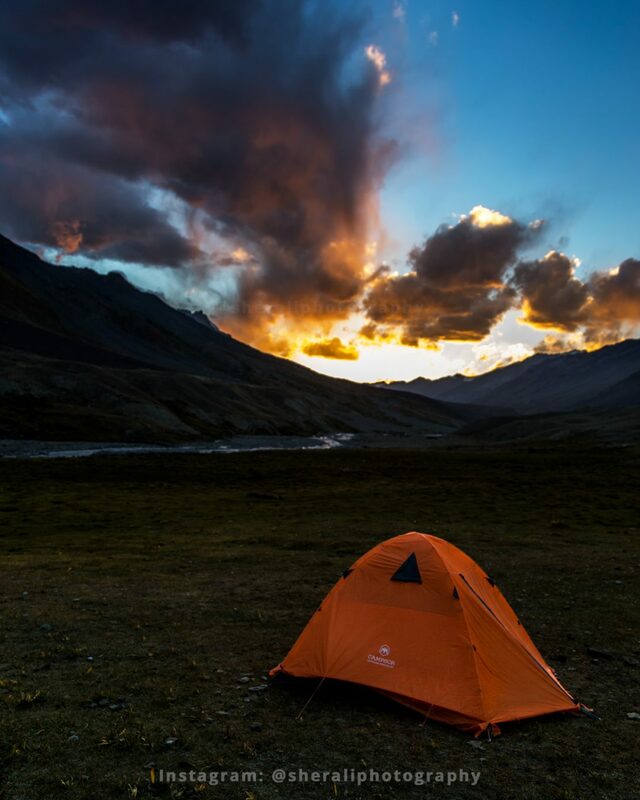 When I reached Khambakh campsite I was surprised to see that now there was proper laid out campsite where we could easily pitch 3-4 camps. Saving a day was blessing in disguise because we had run out of rations. Actually what happend is that on 1st day of trek at Baba Ghundi Ziarat when Hafeez went to bring the additional 3 porters he brought 2 which means they were still short of 1 porter. They had left some of their own ration back there and by mid trek they had started using ration from our share (This is common practice in northern areas of Pakistan that porters bring their own food except tea, sugar and milk. They usually carry thick dried bread which lasts for months unspoiled). From Lashkargaz we had managed to get some rice but still we ran short of food and ate whatever rice was left for that last night. In the morning we had tea without sugar which was also finished. We came down too quickly from Khambakh campsite and then me and Hafaeez decided to run towards Darkot pass to catch a vehicle. There were lots of things going in my mind like what will I eat when I go back home. Especially the thoughts that how will I contact Abdullah to tell him that we have covered our trek in 2 days which were supposed to cover in 3 days. I wanted him to wait for us at Gahkuch instead of coming to Darkot village. Now the reason I wanted him to come to Darkot village at first was due to the reason that we thought that we will come to Darkot village then it will be around afternoon and by that time we will not find any vehicle to take us to Gilgit. So I wanted Abdullah to book a vehicle from Gahkuch and bring it for us. During all this run of thoughts and running towards Darkot village I bypassed a person, just said Salam to him, who was loading grass on 2 donkeys. After me was Hafeez whom that person had stopped and asked him that from where we were coming. He was surprised to hear the story from Hafeez and told him to go with him to his home as he has V-PTCL there and can arrange the vehicle for us. Hafeez whistled me to stop and hear out that person. They came to me and told me about all that. That person, Javed, was actually from army, deployed on UN peace mission at Congo, who had come home on vacations. He took us to his home and brought us breakfast which was like Man O Salwa from heaven at that time. You can imagine how good you will feel when you been trekking for 12 days, run out of ration and barely drink powered milk in the morning. It was just my and Hafeez’s luck to have that delicious breakfast because the rest were coming behind us. There are couple of Toyota hiace which depart for Gilgit in the morning. One had already left and other one was on rest for today. Javed called him and requested him to take us to Gilgit. He agreed but after waiting for an hour he didn’t come. Javed tried to contact him again but he didn’t pick the calls now. We decided to go to the driver’s place and personally request him to take us to Gilgit. We thanked Javed and left for the driver’s home. After asking few people we finally found his place where he was having quality time with his kids. We requested him to take us to Gilgit to which he finally agreed. After monetary deal we were all set to depart for Gilgit. The road journey towards back home had begun and now our only worry was to communicate somehow with Abdullah and inform him about the new situation. After an hour drive in the Yasin valley we finally found mobile signals and started calling him but no avail. Then I thought of calling Usman Zubair but unfortunately I didn’t had his contact number. Then I thought of getting Usman’s number and the only person from Instagram whom I knew was Ibrahim Zauq. I had Ibrahim’s number since earlier in March we had a day trip together to Chham waterfall. I requested him to get me Usman’s number asap. He got me Usman’s number and then I started calling Usman. He was also travelling so he was mostly out of signal zones but then he was in signal area and told me that he had dropped Abdullah earlier today at Gahkuch. So now our only way was to somehow contact Abdullah. Then an idea came to my mind that we should stop each and every hiace coming our way to see if Abdullah is in one of them. By doing this we stopped almost 5-6 vehicles and then came that golden moment when we stopped a Hiace and immediately saw Abdullah sitting inside that vehicle. We rejoiced, hugged each other, congratulated everyone on successful trip and departed for Gilgit. We reached Gilgit by evening and spent night there in a very average hotel near bus stand. 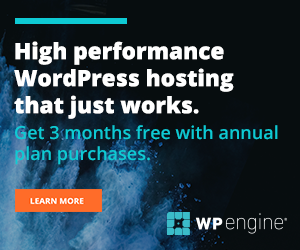 I would like to thank Abdullah, Amjed bhae, Subhani bhae, Hafeez Gojali, Hussain, Israr, Azam Dario and the rest of the members of our team who made it all possible. 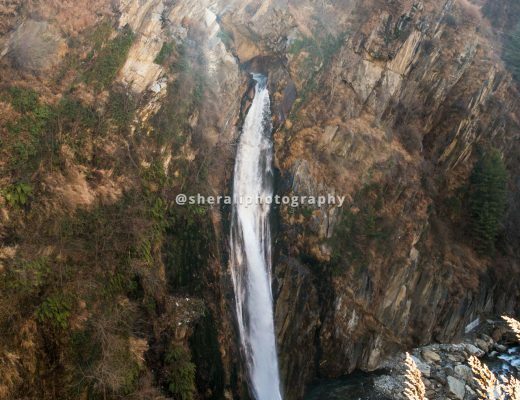 Please do share this travelogue with your travel friends. With time govt rules and regulations change. 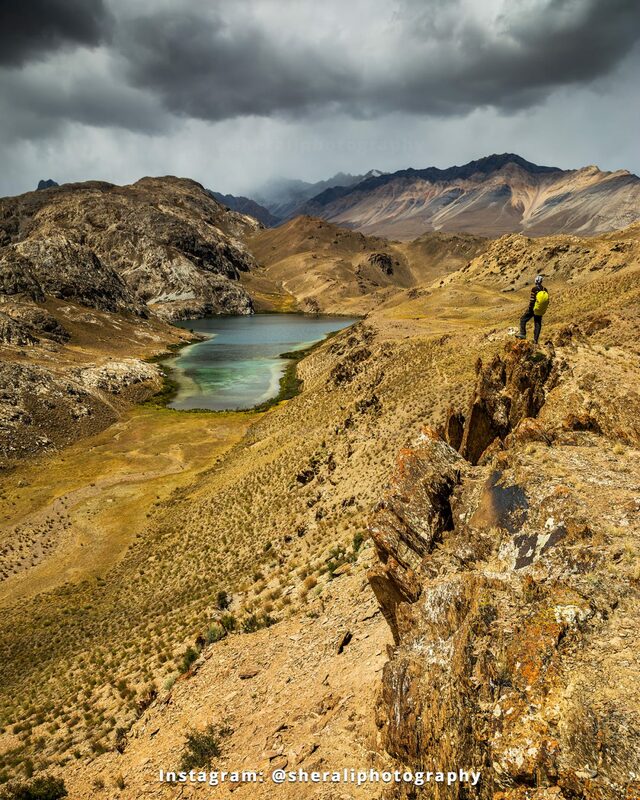 Back in 2017 there was no prohibition on exploring Darwaza pass lakes. From 2018 Army and civilian govt of Chitral has changed the rules and it is specifically mentioned in the letter from army that tourists will not go towards Darwaza pass lakes. 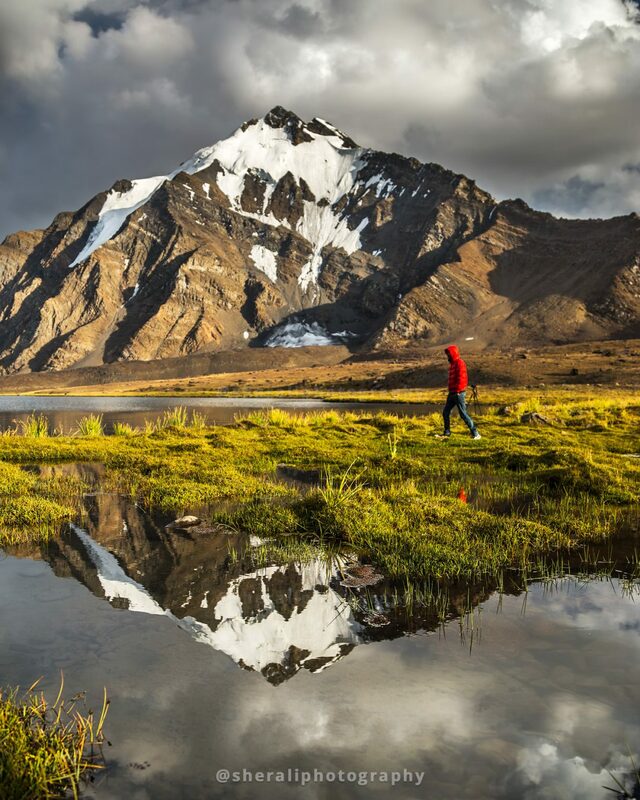 Awesome, I have almost read all of your Travelogues and I want to thank you for sharing such a memorable experience of your treks. Such a delight to read your travelogue. Gripping and intriguing! However, more pictures would be icing on the cake!